As your website grows, you’ll probably need to publish more content at a faster pace to keep your audience engaged. With so many things to do, it’s easy to become overwhelmed. Article deadlines can start falling through the cracks, authors may not know what they’re supposed to work on, and more. The easiest way to stay on top of everything is to add all the tasks you need to take care of to a calendar. This is also known as a ‘content calendar’, and can be shared with all your team members to keep everyone on track. Using a content calendar can enable you to keep the quality of your creative output consistent, even when you’re drowning in work. 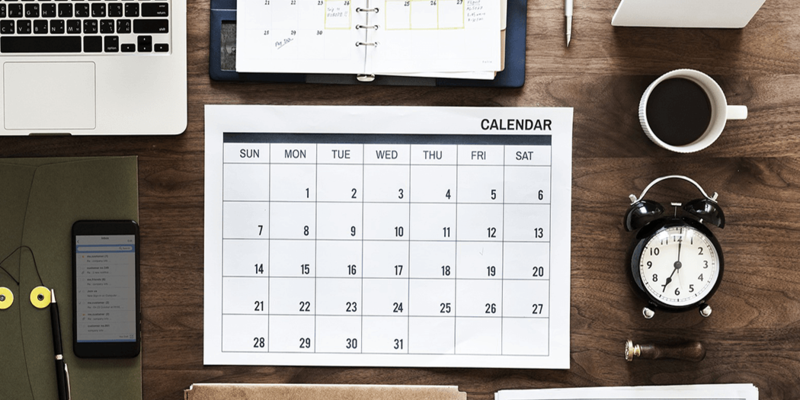 In this article, we’re going to talk more about what content calendars are, and discuss how using one can help you run a tight ship. We’ll then introduce you to two tools you can use to create a content calendar, before showing you how to actually build one. Let’s get organized! Using a content calendar is an excellent way to stay on top of all your management duties. A content calendar is a schedule that includes information on when various stages of your projects are due. For example, your calendar might tell you when each post draft should be completed, when it needs to be edited, and when the final article is scheduled for publication. This information can be simple enough to keep track of if you’re just one person, but becomes a lot more complicated when you’re part of a team. Using a calendar helps you organize your content and tasks, and makes it easier to re-assign work if needed. Content calendars are almost a necessity if you have multiple people working on your website. However, they can come in handy even if you’re on your own, since they help you stay organized and develop a better content strategy. You don’t need any advanced features to set up a basic content calendar. In fact, you can use any online calendar service you want, and just add teammates and information as needed. However, the two services below offer several advanced features that can make your job a lot easier. CoSchedule is one of the most comprehensive online collaboration services. It enables you to create calendars for your projects, add members, and schedule and assign tasks. CoSchedule also integrates with WordPress websites and social media accounts, enabling you to schedule both blog posts and social media publications with ease. Create content calendars for each of your projects. Add members to your calendars, assign tasks to them, and monitor performance. Schedule blog posts, social media publications, and other types of content. Integrate with platforms such as WordPress, Twitter, Facebook, and more. Price: CoSchedule plans start at $40 per month for a single user, and $9 for each teammate you want to add. Unlike CoSchedule, Trello isn’t built around calendars. Instead, this service enables you to set up to-do boards, lists, tables, and other methods for keeping track of what needs to be done. With Trello, you can set dates for each task and assign them to specific members. You can also add as many people as you want to your team and have them set up their own tasks, update each one as it progresses, and much more. Use a system of boards, lists, and tables to keep track of tasks. Add new members to your team. Let members update elements on each board as they progress. Price: Trello offers a robust free plan, and premium options start at $9.99 per user, per month. Now, let’s talk about how to set up a fully-featured content calendar using CoSchedule. First, you will need to sign up for a free trial. Then you can get started! When you have completed the wizard, CoSchedule will open your calendar so you can get right to work. That covers the basics of how to add content to your calendar. Before we wrap up, however, let’s look at how you can manage existing tasks as well. Clicking on that option will enable you to invite coworkers to your calendar using their email addresses. When they accept your invitation, you’ll be able to assign tasks to them from your calendar, and they’ll receive notifications whenever that happens. Keeping everyone updated and on the same track couldn’t be easier! Calendars are incredibly simple tools, but they’re also highly effective when it comes to helping you stay on top of your duties. A content calendar is an excellent way to keep track of your content schedule, the topics you want to cover, who’s working on which projects, and so on. CoSchedule: A powerful, calendar-based tool to help you organize your content. Trello: This service helps you stay on top of content scheduling using to-do boards. Do you have any questions about how to implement a content calendar for your website? Let’s talk about them in the comments section below!